Rochberg's 'art of combination' is in fashion and, thanks to ubiquitous and instant communication, taking on new forms. The combinations in this case include Western-classical and Chinese-folk music, electronic/acoustic timbres and instruments of both East and West. Tan Dun is one of the most visible practitioners of an East-West musical merger, and his participation in this project correctly suggests that the result is largely tonal, well executed, and enjoyable for listeners who can adjust to the exotic part of the mix. The recording itself includes an unusual combination -- of ensembles: full orchestra, nonet and guitar quartet. Each performs a different tone poem, the first of which goes to the conventional symphony-orchestra conducted by Dun. The piece, not surprisingly, is reminiscent of some of that composer's music for film. Dr Chen worked with Dun on Crouching Tiger, Hidden Dragon. 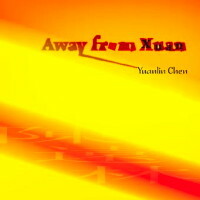 Chinese folk songs permeate Away From Xuan (the mysterious abstract). The work is intended to be a description of 'innocence and nature'. In spite of the folk songs, Chen falls short on innocence. Sharp dynamic contrasts, sophisticated orchestration, and powerful brass are better at the nature half of the goal. Take this Stravinsky-like ending. Information on how to play this media file. The instrument mix makes for some particularly unusual and intriguing textures in the Andante movement. The guitar quartet also manages some marvelous textures as the imagined protagonist of Chasing the Sun pursues that elusive fiery orb. This final work on the program was inspired by an old Chinese myth that tells the story of a man who wanted to embrace the sun so that he could ever enjoy its warmth. He chases it from East to West, through jungles and deserts and over mountains, until he finally dies in the pursuit. But he dies a happy man, for the chase gave meaning to his life. Chen's comprehensive training in both Western and Eastern music is evident. Mixed styles often result in embarrassingly clumsy and incongruous moments. Think of how some composers have misused rock or jazz. Here the integration is near flawless. Dr Chen has confirmed that the intelligent art of combination is one of the ways classical music can remain relevant and perhaps expand its audience.